The growth of cognitive skills is an essential part in completing a toddler’s development. During your toddler’s first few years, it is imperative that you let him learn and identify his sense of self in the world. In order to help improve his performance, supply him with intellectually stimulating activities. Your toddler’s brain development is rapidly increasing as early as the age of 1. Hence, it is very important that your little one is well-equipped to make him effectively correspond with himself, the people and the world. Here are some of the best tips on improving the cognitive development of children which you can easily use to help your toddler reach his prime. His brain needs all the nourishment he can get. The quality and quantity of healthy and unhealthy foods you feed your toddler is an essential factor of brain development. Breastfeeding supplies him with all the right vitamins and minerals he needs to help develop his brain muscles. Having a healthy balanced diet is also essential. To keep your toddler interested in his food, prepare his meals with variation. A small serving of rice, fish, carrots and apples is healthier than a whole serving of vegetables as he will only reject the latter. Stacking, filing or building blocks helps improve his cause and effect, motor skills and special awareness. Toy blocks with an illustration he can follow gives him order which helps your toddler’s mind retain things easily. A well-loved game of toddlers, this game allows your little one to utilize his thinking and problem solving skills to locate objects and people. A simple hide and seek game like giving him a list of things to find hidden inside the house or picking up his toys and putting them where it belongs exercises his brain. To make it extra fun, do it together but let your toddler find the objects, just give him directions when he is having a hard time. A make up story or a puppet show challenges him to come up with something interesting and unique which helps increase your toddler’s thinking skills resulting to an improved language and vocabulary. Music and books are the best tools to make your toddler learn. Sing along to his favorite nursery rhymes and songs. A pleasant song with recurring words not only gives him something to enjoy but it also encourages him to learn how to positively associate words with other words. During his playtime and bed time, read to him children’s books with different topics. Most likely, he will have a grand time pronouncing the words on his own increasing his speech and verbal ability. Your toddler needs to be physically active. The more he uses his body the better as this helps improve proper blood circulation allowing more oxygen to reach and refresh the brain. Simple activities like running in the backyard, sliding or climbing the monkey bars in the playground or regular walks in the neighborhood will do. Toddler cognitive development is a continuous process. Hence, utilizing basic learning tools that are fun and interesting engages your child and keeps him determined to improve such skills over time. During your toddler’s development stage, varying factors arise allowing your child to adjust and adapt a lot easier with the people around him as well as his surroundings. In this period, cognitive progress is to be expected. Thus, helping your child increase his capabilities will truly help him learn faster. Puzzles are an innovative means to learn certain skills before your child enters school. Jigsaw and learning puzzles can work wonders for educating your child in a number of areas such as his motor, problem and reasoning skills. To hone toddler cognitive development, jigsaw puzzles are great learning materials you can invest in. Aside from its affordability, you can mix entertainment and education at the same time making it easier for your toddler to learn. The eye-catching and vibrant colors and the uniquely shaped pieces will appeal to your child and as a result, becomes very effective and useful. Almost every child expert admits that child jigsaw puzzles are the best way to early educate your child and since these learning materials are easy to read and understand, it sticks to a toddler’s mind quickly. Let us take a look at how these puzzles can help boost your toddler’s learning growth. Logical thinking is increased through matching activities. Learn shape and size recognition for introduction to pre-reading. Advances hand to eye synchronization. Learns the trait of perseverance (since your child needs to be determined in order to complete the puzzle). Wooden Puzzles – Wooden jigsaw puzzles are great introduction for beginners because they are specifically made to be durable and easier for young toddlers to solve. Wooden pegs are included to help your child easily match the image of the puzzle pieces with the image at the bottom of the board. This hones your child’s attention allowing him to concentrate on his work, recognize which puzzle piece go with which picture and remember things well. This guides your toddler to develop early reading of letters and numbers. 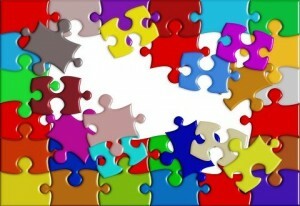 Foam Puzzles – Foam jigsaw puzzles can be easily made at home. You and your child can make this together allowing for a fun bonding time as well. However, because these puzzles are very soft, it is not recommended for young toddlers as they might eat it. The best foam puzzles are the ones with drawings in it such as an airplane, egg, fish or dog. It allows a more receptive approach helping your toddler identify shapes and things accordingly. You can also opt for puzzles that can be formed into a Rubik’s cube. This allows your child to be intellectually challenged as this will help him form strategies in order to solve the puzzle. Magnetic Wooden Puzzles – During this toddler stage, puzzles using magnets allows your child to refine his motor skills since putting the picture puzzle pieces to match the shape of the hole requires the use of a magnet (a fishing pole, net or tow) instead of using only his hands. Educational Puzzles – While every jigsaw puzzle is educational for your toddler, focus on puzzles that relay information about different topics. For example, you can try out formation of the letters in the alphabet, the map of a country or the structure of an animal. In this way, your toddler gets to put all the different pieces together boosting his capability to produce and solve challenges on his own. Piling Puzzles – Piling or stacked puzzles entails your toddler to use his problem solving skills in order to construct and build the pieces together to form the puzzle. Your child becomes ready to think on his own therefore permitting him to make personal decisions based on what is right and wrong. Finally, jigsaw puzzles are a great way to enhance the cognitive skills of your toddler. But see to it that you play with your child to assist him in completing his tasks, allowing him to enjoy solving the puzzles more.